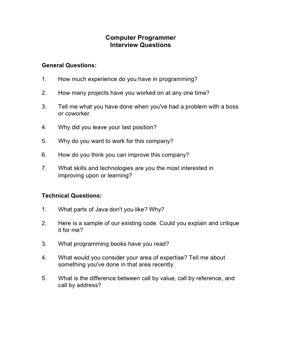 Choose your next Computer Programmer with the aid of these helpful interview questions. 1. How much experience do you have in programming? 2. How many projects have you worked on at any one time? 3. Tell me what you have done when you've had a problem with a boss or coworker. 4. Why did you leave your last position? 5. Why do you want to work for this company? 6. How do you think you can improve this company? 7. What skills and technologies are you the most interested in improving upon or learning? 1. What parts of Java don't you like? Why? 2. Here is a sample of our existing code. Could you explain and critique it for me? 3. What programming books have you read? 4. What would you consider your area of expertise? Tell me about something you've done in that area recently. 5. What is the difference between call by value, call by reference, and call by address?